Please join the Lillian Goldman Law Library, Yale Journal of International Law, Yale Law National Security Group, and the Orville H. Schell, Jr. Center for International Human Rights, for a discussion with Professor Harold Hongju Koh and his new book, The Trump Administration and International Law. Commentary provided by Jake Sullivan ‘03. The event will take place on Monday, October 29, 2018, 4:10 – 5:30pm in SLB 129. Will Donald trump international law? Since Trump’s Administration took office, this question has haunted almost every issue area of international law. 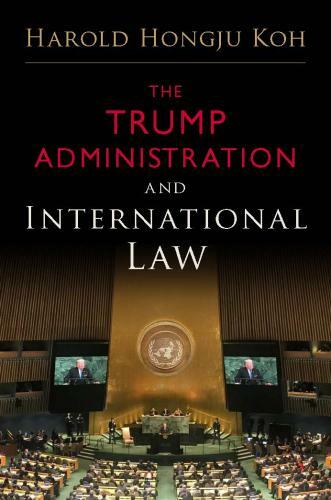 This book, by one of our leading international lawyers—a former Legal Adviser of the US State Department, Assistant Secretary of State for Human Rights, and Yale Law School Dean—argues that President Trump has thus far enjoyed less success than many believe, because he does not own the pervasive “transnational legal process” that governs these issue areas. This book shows how those opposing Trump’s policies during his administration’s first two years have successfully triggered that process as part of a collective counter-strategy akin to Muhammad Ali’s “rope-a-dope.” The book surveys immigration and refugee law, human rights, climate change, denuclearization, trade diplomacy, relations with North Korea, Russia and Ukraine, America’s “Forever War” against Al Qaeda and the Islamic State, and the ongoing tragedy in Syria. Koh’s tour d’horizon illustrates the many techniques that players in the transnational legal process have used to blunt Trump’s early initiatives. The high stakes of this struggle, and its broader implications for the future of global governance – now challenged by the rise of populist authoritarians – make this exhausting counter-strategy both worthwhile and necessary. This ebook is available through Oxford Scholarship Online (link is external; connect to Yale network to access). Publisher’s page, Oxford University Press (link is external), and Amazon (link is external) page. Harold Hongju Koh is Sterling Professor of International Law. Jake Sullivan ‘03 is Martin R. Flug Visiting Lecturer in Law.